It goes to show you can have some really messy fights when one of the individuals is literally immortal. Apparently that allows Nanatsu no Taizai to bring on the blood. 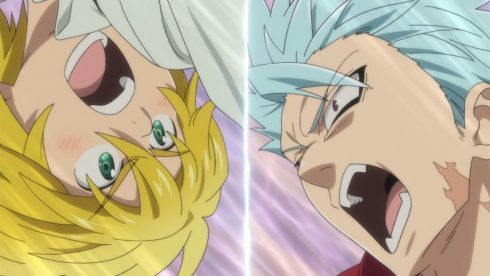 The episode was mostly focused on the showdown with Ban and Meliodas which was pretty enjoyable. A 1v1 weaponless brawl that showed the strength both these individuals have. It really only was because they were fighting that this ended with laughs. No one else there could seriously get into a fist brawl with these two and walk away unscathed. Even a giant like Diane (normally) would have some trouble if not just get knocked down pretty quickly. Ban and Meliodas have power that goes well beyond size. Of course the biggest problem with Nanatsu no Taizai is that no major groups or streaming services pick it up! There may be subs that pop up over the next few days, but maybe not. So I’m just going to talk about these few episodes based solely on the RAWs. I’m not sure if anyone will end up reading because of that, but that’s how I’ll be handling this. It was interesting having people try to turn this into a festival rather than a fight to the death. Kind of a given but the other Sins would hardly sit around and do nothing if they decided to try and kill each other. You would expect them to have rules that basically forbid murdering each other. The fight last season could happen because no one else besides Hawk was there. It was basically the one opportunity to have something like that happen. Of course I don’t think with time allowed for heads to cool that Ban would decide to go this route. An opportunity to revive Elaine was dropped on him and he leapt upon it. Even if it meant killing his friend his despair and grief was powerful enough to make him willing to try. 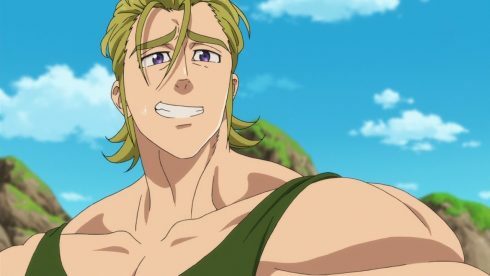 I think a lot of people would struggle with Ban’s situation. I can’t even imagine facing eternity without ever being able to see a loved one again. Obviously life involves losing people, but people aren’t immortal. We can at least comfort ourselves in some way if we believe we’ll see them again after death or that we only will miss them until we die. Ban has neither of those options. He’ll live forever with that loss and forever is a really long time to live like that. 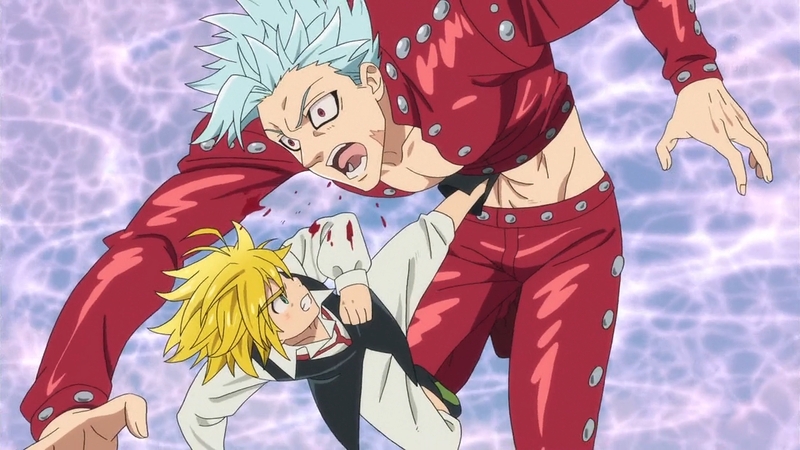 In the end though Ban still cares about Meliodas. They are best friends. 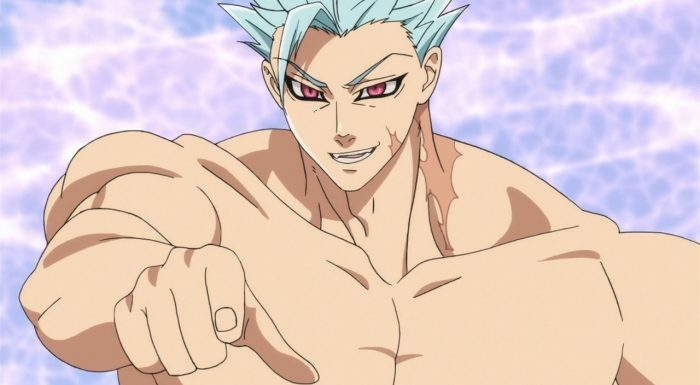 And that’s why I think Ban only took this fight as far as he did. He didn’t use his Hunters Festival against Meliodas and the crowd which might have actually given him a chance at succeeding. 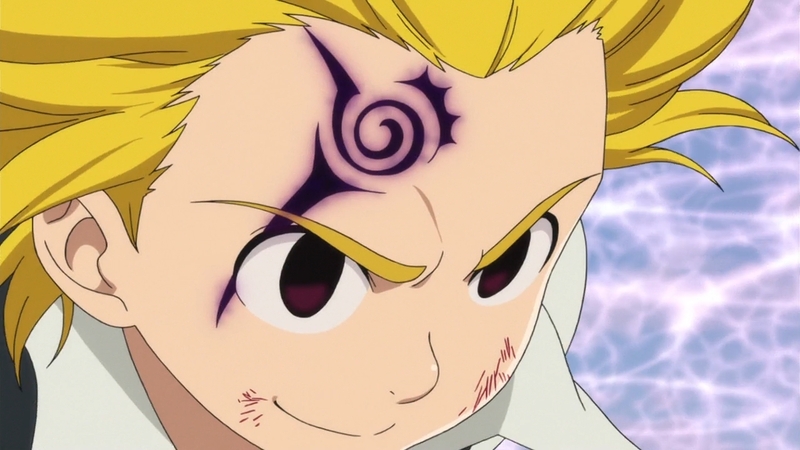 Instead he took it from the crowd so they’d basically stay out of it and he could fight Meliodas at full power. Not something he would do if killing him was the goal. This does leave Ban in an awkward position though. Things are mostly revolved and they aren’t looking to kill each other. Ban still had something to say, but held off this time. Have to wonder what that might be and if we’ll find out in the next couple episodes. 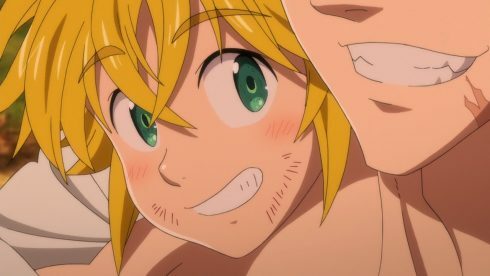 Meliodas seems pretty comfortable with how things concluded though. They had a bit of fun and no one was permanently hurt. I can only say that because both of them were definitely hurt temporarily. 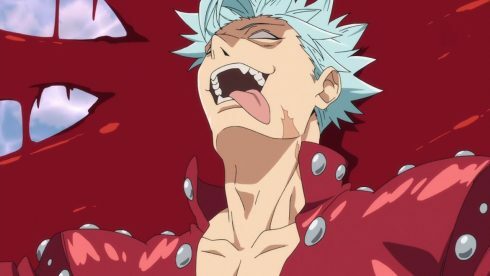 Meliodas having that demonic healing ability and Ban being immortal. They both could take some serious injuries and keep on going. Only exhaustion was the price they paid at the end of the day. That fight was pretty fun and had some great little moments. 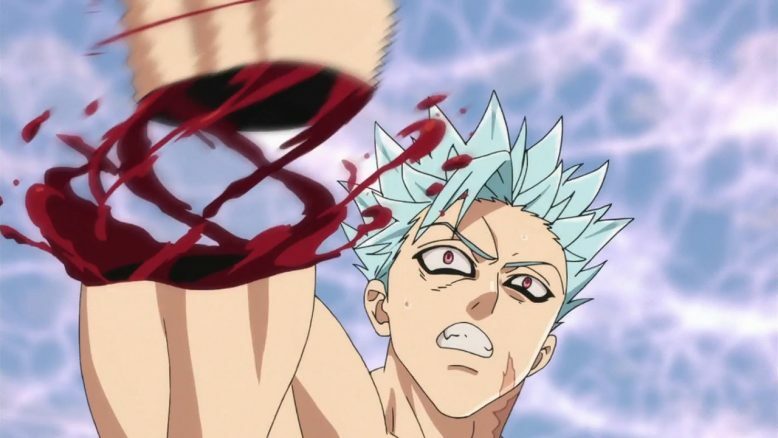 I mean Ban getting his powered up arm torn off was nuts! And then of course he just used his power to yank it back to him and his immortality handled the rest. Just an ironic contrast to covering Re:Zero. Here we have two people who basically can’t die, but can suffer some serious damage. And there we have a main character who is incredibly weak, dies easily, but will come back. Two ways of having some messy sequences, but not have anyone permanently die from them. This episode seemed to be ready to transition to the love triangle next week. King and Howzer getting pretty rowdy and starting their own fighting festival. Although clearly King let the blood run to his head and forgot that you can’t use weapons in a fighting festival. That left him basically helpless and standing no chance against Howzer. Although in that case Howzer did at least make sure to hold back his strength and not really hurt King. Not sure if I’m that concerned about this love triangle since it doesn’t feel like Howzer stands a chance here. But, maybe it will be nice to get that resolved before we run out of episodes for this mini-series. The other big focus was on Dreyfus being on the hunt for Hendrickson’s arm. Yeah, that’s a weird thing to say but it is the situation. If we didn’t have confirmation that Dreyfus was pretty freaking evil before…his murdering that family sealed it. 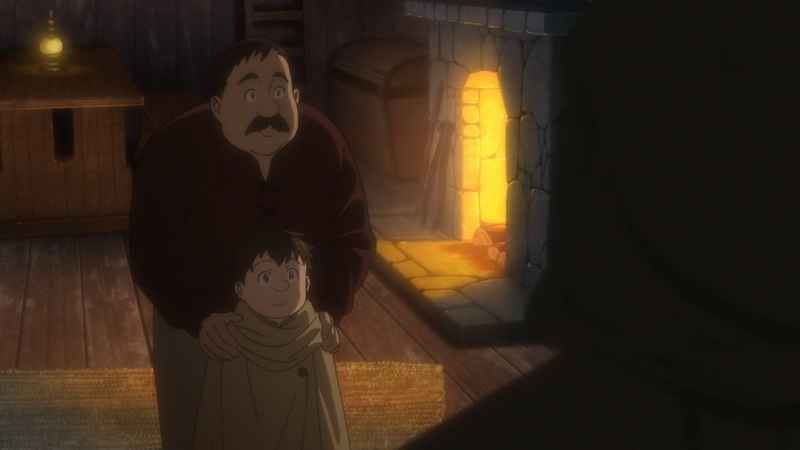 I mean holy crap he went ahead and killed that kid and his father after they gave him the information he wanted! What the heck is going on with this guy? 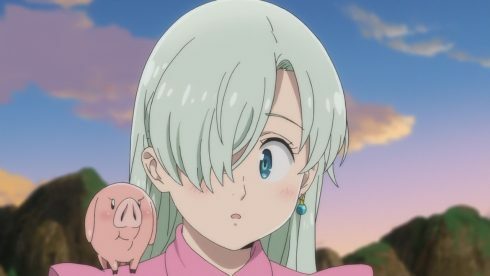 I’m guessing we’ll find out in the next episode or two by the way they are teasing this story at the end of the episodes. Not a bad episode. The overall story of the episode focused on that fight, but there was a lot going on. The King’s vision of basically annihilation, King Vs Howzer, and the discussion about the fight by everyone else watching. I enjoyed the action parts and only wish there was a bit more of that. It is fun that sometimes Ban really does seem more like a guy you’d have as a villain than one of the heroes. Just has a lot of fun with whatever he gets himself involved in. I’m curious what else might happen next week outside of Howzer and King fighting over Diane. Maybe actually confirming what she thinks XD. 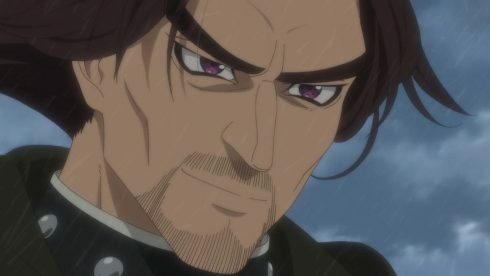 The biggest part may come at the end if they continue Dreyfus’s journey and we find out just what he’s trying to accomplish.